On The Menu: Prosperity And Luck? Justin Kimbro isn't sure if eating pork, black-eyed peas and greens on New Year's Day will change his luck in the coming year. But he'll eat them just in case. "I've never not eaten it," said Kimbro, of Murray, Ky. "I don't like to take chances." In parts of the South, those foods are supposed to bring good luck and prosperity. Many cultures have special New Years foods, from lettuce in China to lentils in Italy. "We don't have that many rituals left. People get excited about doing the same thing year after year," said Mitchell Davis, vice president of the James Beard Foundation in New York, a group devoted to America's culinary heritage. Betty Hakes, who was raised in a Cuban neighborhood in Miami, grew up eating 12 grapes at midnight on New Year's Eve. "As a child, I never questioned why you did that," said Hakes, who now lives in Cincinnati. It wasn't until she moved away from home that she realized it was not a common practice and began wondering about its history. She later learned that the tradition started in Spain, where some people make a wish each time they bite into the grape. Others believe the grapes represent the months of the year, and that a sour grape signals an unlucky month. "There have always been lots and lots of food superstitions," said New York-based food historian Francine Segan. "People love to keep tradition. It's something they do even if they forget what the tradition was." New Year's foods typically have properties that suggest good fortune, said Tina Ujlaki, executive food editor for Food & Wine magazine. Beans or leafy vegetables are favorites because they resemble coins and dollar bills, she said. "Even cultures that don't have green money have adopted the association of green and cash," Ujlaki said. Pork also is popular, she said, because it's said that pigs root forward and no one wants to dwell on the past. Some cultures shy away from chicken because no one wants to scratch for their meals or their livelihood. And foods that expand during cooking, such as rice or noodles, also appear in many of the meals because they suggest abundance, Ujlako said. "Everyone wants only good things going forward," she said. "All of these foods encourage that." 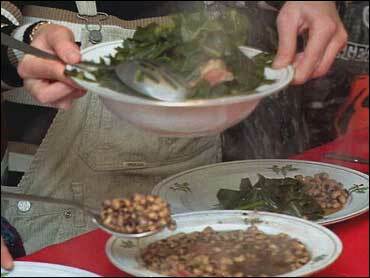 Hoppin' John: Southerners eat this dish made with pork and black-eyed peas. Both of the main ingredients have lucky connotations: pork because of a pig's tendency to root forward, and peas for their resemblance to coins. Pork and sauerkraut: Germans and some Eastern Europeans serve sauerkraut with their lucky pork because cabbage resembles money and seems to increase its yield when cooked. Mochi: Japanese eat these sticky rice cakes topped with a bitter orange called daidai. The orange makes the dish lucky because daidai also means "several generations." Lentils: Italians often prepare a meal of pork sausage and lentils on New Year's Day because of their coin-like appearance. Lettuce: People in some parts of China eat foods wrapped in lettuce during the Chinese New Year because the word for lettuce is similar to the word for "rising fortune." Noodles: Long noodles served uncut also are common fare during Chinese New Year. Noodles, which are also served in Japan on Jan. 1, symbolize a long life. Apples and honey: During Rosh Hashanah, the Jewish New Year, apples and honey symbolize the wish for a sweet new year.